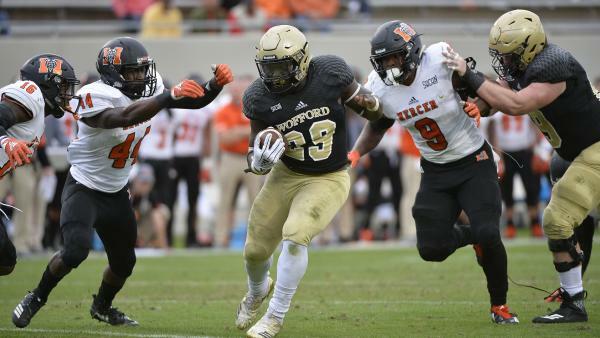 The ninth ranked Wofford Terriers used their ground game as expected but the close to 200 yards through the air helped the Terriers hold on to first place in the SOCON defeating Mercer 42-21 in Spartanburg. Wofford rushed for a season high 359 yards, led by Andre Stoddard’s 119, while holding the Bears to just 88 yards on the ground. It was T.J. Luther’s 71 yard and 50-yard touchdown receptions that helped Wofford take a 28-7 cushion into the fourth quarter. Wofford quarterbacks Matt Moseley and Joe Newman combined to throw for 199 yards while completing 9 of 16 passes to lead a balanced Terrier attack with 558 total yards. Six different Terriers caught passes while Lennox McAfee tallied 92 yards on the ground on 8 carries. Kaelan Riley led the Bears offense with 192 yards on 12 completions and a touchdown. The Bears entered the game with one conference loss and controlling their own destiny regarding a SOCON title and automatic bid to the NCAA FCS Playoffs. Wofford remains a leg up on East Tennessee State for the automatic bid and SOCON Title by virtue of the Terriers 30-17 win over the Buccaneers last week. The Terriers face a stern test next week as they travel to Birmingham to take on Samford. Mercer returns home to host East Tennessee State next week in a game that is now pivotal for the Bears if they have designs on making their first ever NCAA FCS Playoff appearance.